Lieutenant Colonel Sargis Sangari was born and raised in Rezaiyeh (Urmia), Iran. He immigrated to the United States in 1980 at age ten after the Iranian Revolution. LTC Sangari received a two-year Reserve Officer Training Corps scholarship and began his Army service in 1994 after graduating from DePaul University in Chicago, Illinois, earning a Bachelors of Science in Political Science and receiving a commission in the Infantry. After completing the Infantry Officer Basic Course, he was assigned to 1st Battalion, 506 Infantry Regiment (Air Assault), Camp Greaves and Camp Giant Korea, where he served as a two-time Rifle Platoon Leader. Upon his departure from Korea, LTC Sangari was assigned to the 1st Battalion, 24th Infantry Regiment, Fort Lewis, Washington, serving as a Rifle Platoon Leader, Mortar Platoon Leader, Headquarters and Headquarters Company Executive Officer, Battalion Motor Officer, and Battalion S3 Air. LTC Sangari deployed to Bosnia-Herzegovina and Croatia in support of Operation Joint Endeavor as the principle staff advisor for Chief of Staff Military Operations for U.S. Forces and National Agencies force protection for Implementation Forces (IFOR) and Stabilization Forces (SFOR) and the theater safety officer for all of Theater SFOR. After completing the Infantry Officer Advance Course, LTC Sangari was assigned to Basic Combat Training Brigade, Fort Benning, Georgia as Company Commander, Brigade S-4, and Brigade Assistant-S3. LTC Sangari was later assigned to United States Army Recruiting Command as the Headquarters Headquarters Company Commander/Facility Manager, Special Projects Officer in support of the ongoing efforts to recruit language speakers in support of Operation Iraqi Freedom and Operation Enduring Freedom, and Assistant Current Operations Officer. Upon completion of the Civil Affairs and the Regional Studies Courses, LTC Sangari was assigned as Civil Affairs Team-A Team Leader with 96th Infantry Battalion. His team deployed to Iraq in support of 1st and 5th Special Forces Groups in the Al Anbar Province. After the surge approval, his team stayed to support the Navy Tasking Unit. Upon his team’s return, LTC Sangari attended and graduated from the Command and General Staff College at Fort Leavenworth, Kansas. After graduation he deployed in support of 10th Mountain Division (Light), Fort Drum, NY as the Deputy G9. LTC Sangari’s follow-on assignment was a family sponsored diplomatic billet as the Director of Host Nation Affairs for Area Support Group-Kuwait. Upon his return, he was assigned to John F. Kennedy Special Warfare Center and School (USAJFKSWCS) where he served as the Director for the Basic Language Course, Quality Assurance Action Officer, and special project officer for DCG USAJFKSWCS. He completed his 20 years six-month career as the Quality Assurance Officer for the Civil Affairs Directorate. His awards and decorations include the Combat Action Badge, Expert Infantryman’s Badge, and Parachutist Badge. His foreign awards include German Armed Forces Efficiency Badge in Gold and German Armed Forces Marksmanship Badge in Bronze. LTC Sangari language capabilities include Assyrian/Aramaic, Persian-Farsi, and Turkish-Azari. LTC Sangari is a Certified Anti-Terrorism Level I & II officer. LTC Sangari is currently the Chief Executive Officer of the Near East Center for Strategic Engagement LLC which he started on September 11, 2014. 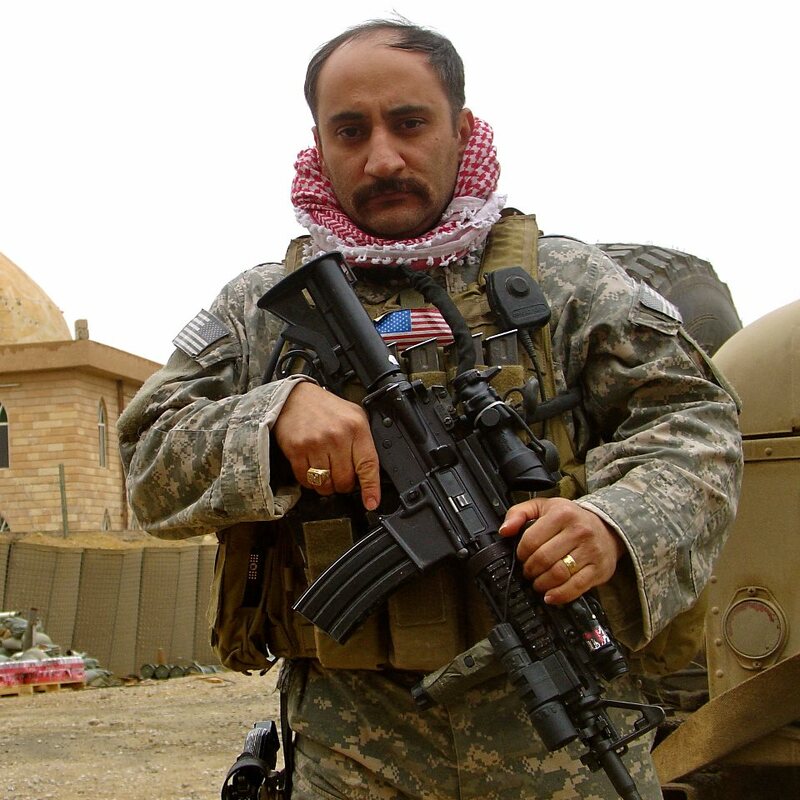 LTC Sargis Sangari, USA (Ret.) is the CEO of the Near East Center for Strategic Engagement (NEC-SE), which is an academic and operationalized policy studies/research institution and think tank that provides political/military analyses and assessments of Middle Eastern affairs for a diverse international clientele representing both government and private interests. Additionally, NEC-SE served as the military advisory group for the Assyrian Army in Iraq, which fought in Iraq and Syria against ISIL and ISIS from 2014-2017. In that capacity, NEC-SE worked in collaboration with Assyrian Army military and civilian leaders and private military contractors to provide tactical, operational, and strategic planning, direction, training, and support for conducting combat and civil affairs operations in tandem with its military mission. The NEC-SE team has briefed the Office of Secretary of Defense; authored Operation Collective Action; operationally supported CENTCOM; advised the Near East Affairs Iraq and Syria desk at The U.S. State Department; and briefed the National Security Counsel key staffers on strategic plans for the Near East Region; and provided strategic assessment white papers on the Middle East and South East Asia. NEC-SE has also provided a number of key reports, briefings, regional assessment reports, and white papers to our global partners to include Japan (Five Eyes) the Japanese Public Security Intelligence Agency, and Australia (Core-plus member nation of the National Military Bureaus). NEC-SE has also supported Ravens Challenge ASEAN 2017 & 2018. The Mission of Ravens Challange is to build and Shape Explosive Ordnance Disposal (EOD), Counter Improvised Explosive Device (CIED), Countering Weapons of Mass Destruction (CWMD) and Counter-Terrorism Capacity Streams for Local, National, and Regional Clients and to Provide Multi-National Dynamic EOD, CIED, CWMD, and Counter-Terrorism Training, Collaboration, and Information Exchange Among Military, Police, Academia, and Private Agencies. NEC-SE supports the goals of Ravens Challange ASEAN by training the various units participating in the challenge and by bringing information from the Iraq and Syria battlefields to the participating commanders and technicians form Thailand and SE Asia at Ravens Challenge. Sharing the knowledge and lessons learned from the impact of IEDs and other methods on communities in the Middle East has resonance and relevance here in Thailand and Southeast Asia as well. This allows a more holistic approach to identifying and reduction of capability gaps in the broad spectrum of responses to terrorism and insurgencies that use asymmetric attacks against vulnerable populations. LTC Sangari is a 20 plus-year veteran of the United States Army Infantry and Special Operational Forces. His career as a soldier included multiple combat deployments to Iraq, plus other deployments to the Middle East, Europe, Asia, Central America, as well as a diplomatic assignment in Kuwait. Over the course of six years of continuous combat deployment, LTC Sangari conducted 144 combat patrols, 22 Special Forces missions, and two key direct-action operations. He conducted 670 key leader and tribal leader engagements in support of multiple counterinsurgency operations and wrote three major policy papers for the Special Operations Forces and the U.S. Marines on the subjects of federalism and governance and an executive summary on civil-military operations. These policies legitimized three newly elected city councils and two mayors in Al Anbar province countering enemy influence and indirectly allowing a new approach in support of the Sons of Iraq efforts in Iraq. LTC Sangari has also conducted over 17,000 civil-military operations, foreign internal defense support operations, noncombat evacuations, and disaster relief, and emergency management missions. He conducted over 7,000 humanitarian missions throughout the Middle East to mitigate citywide emergencies covering provincial and regional shortfalls throughout in support of unconventional warfare, irregular warfare, and direct action, and contingency operations. LTC Sangari planned resourced and executed the reception and integration of military personnel from the US Army, including North Atlantic Treaty Organization Executive Officers and well-known civilian inter-agency personnel from six different US Civilian agencies, thus creating the groundwork for a Coordinating Reconstruction and Development Activities Cell for operations in Afghanistan. The Specialty Skills Initiative (SSI) became a pilot and case study for how the army recruits, trains and conducts future civil-military operations in both accessible and remote areas of the world. His final major projects before retiring from the army in 2013 entailed the analysis, design, and development of metrics and standards used to accredit the United States Special Warfare Center and School (SWCS) in both training and education, and to include assessments and accreditation of the training which affected all civil affairs, special forces, psychological operations, and other special units personnel totaling between 15-20 thousand persons. He applied his mastery of the latest doctrinal tenants in a thorough analysis of the final draft of the strategic manual on the Concept for the Shaping Warfighting Functions that improved the nesting of the new concepts into the extant Warfighting Functions and the U.S Army Special Operation Command Commanders 2022 vision which the Assyrian Army beta tested on the battlefields of Iraq and Syria. Thank you Lieutenant Colonel Sargis Sangari for your many years service to our nation. I listened to your interview on The Official Hagmann & Hagmann Report last night, and appreciate your insight and perspective on current events. Another show I would recommend you contact would be Caravan To Midnight, with John B. Wells. John offers excellent long form interviews and I think you would make a great guest. Also, X22Report Spotlight offers short form interviews, and the information you have to share is important for people to learn in these current times. are you just another CIA operative? The best hope for the Middle East’s Christians at this time is Putin’s Russia. May the Russian military kill ISIS by the tens of thousands. Too bad American foreign policy would rather aid ISIS that destroy them. If it can be facilitated i would like to go as well. I am willing to get back into shape to go help my Chaldean/Assyrian brethren as I have a deep respect for the people. I am an EX-muslim who in retrospect can’t believe i fell under the spell of Islam especially considering i was raised Catholic and have a 135 IQ. I’ve been shooting AK, SKs and AR rifles for years so shooting is not the problem it is working as a military unit because i have not had that training but I WILL DO ALL THAT I AM TOLD. I can arrange some funding for my travel and equipment. I don’t expect to be paid i just want to serve fellow Christians and especially the Chaldean people. Have you gotten in contact? Thank you for your service and loyalty. I heard you on the radio today. This topic is so important as you well know, yet not allowed to talk about. I will donate and I hope and pray that somehow the support in dollars (prayers already there) will find their way to these brothers and sisters in Christ to feed and defend themselves. We care, but alas, our government over the last years, has done everything they could to help eradicate Christianity both home and abroad. Could they have done more to assist the genocide without sending more of our own troops there to directly kill the Christians too? I don’t think so. Keep up the good work and don’t despair. Keep getting the words “we have to assist”, “we have to do this” out, and “we have to quit waiting for our government” to help. Without hearing you on the radio today, I would not have known how to assist. I understand the fine line you walk in trying to assist these people and being punished for doing so. All my prayers, and those of my guardian angel’s, for you and your family.